The Hall of Fame coach was diagnosed last fall; he's still active, but the diseases are progressing and the prognosis is gloomy. Chris Detrick | The Salt Lake Tribune Rod Hundley talks with Jerry Sloan inside of the newly dedicated "Hot Rod Hundley Media Center" at the EnergySolutions Arena Friday, January 29, 2010. 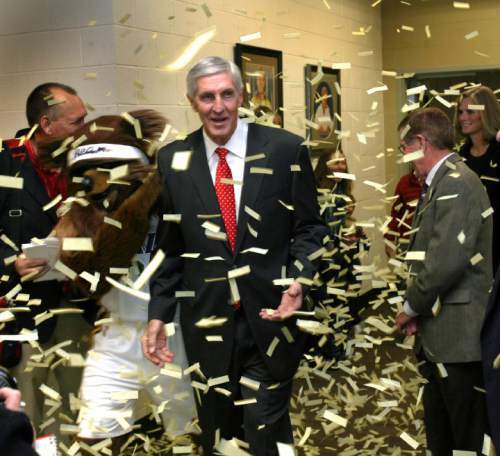 Steve Griffin | The Salt Lake Tribune Jerry Sloan walks through a shower of confetti, shot from a canon by the Jazz Bear, as he attends the Utah Sports Hall of Fame banquet at EnergySolutions Arena in Salt Lake City, Utah Wednesday, November 16, 2011. Sloan along with Phil Johnson, Doug Toole, Natalie Williams and Annette Ausseresses were all inducted into the hall of fame. Leah Hogsten | The Salt Lake Tribune Utah Jazz head coach Jerry Sloan delivers his induction speech. 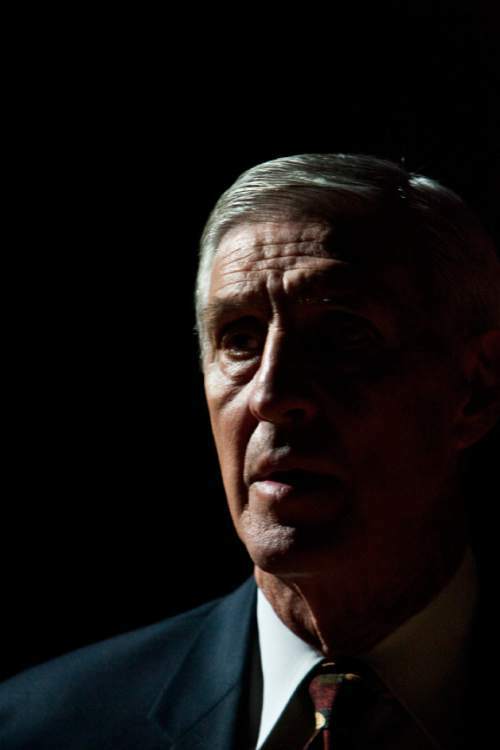 Utah Jazz head coach Jerry Sloan and Utah Jazz point guard John Stockton were inducted into the Naismith Basketball Hall of Fame on Friday in Springfield, Mass. 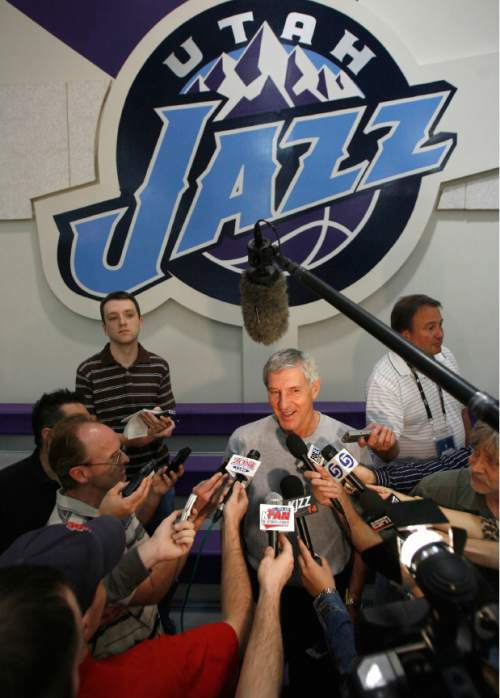 Francisco Kjolseth | The Salt Lake Tribune Head coach of the Utah Jazz Jerry Sloan speaks with the media following the Friday May 25, 2007, practice session at the Zions Bank Basketball Center as they prepare for game 3 of the NBA playoffs. Steve Griffin | The Salt Lake Tribune Utah Jazz head coach Jerry Sloan (right) seems content by himself away from the media as he waits for them to finish their interviews with his players following Monday May 14, 2007 practice at the Jazz practice facility. 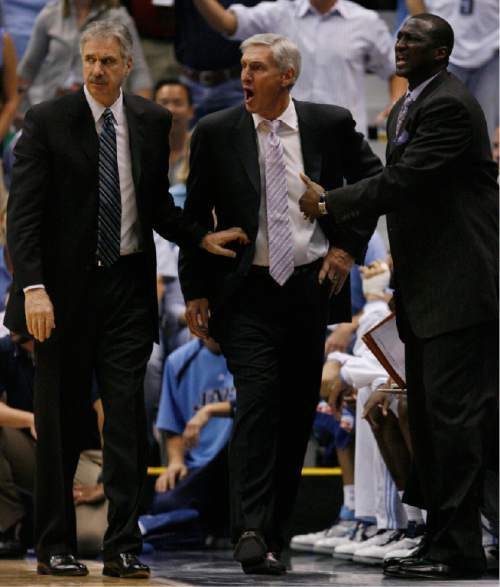 Steve Griffin | The Salt Lake Tribune Utah Jazz head coach Jerry Sloan is held back by assistant coach Phil Johnson (left) and Tyron Corbin during second half action of the Jazz, Spurs NBA Western Conference Finals game 4 at the EnergySolutions Arena in Salt Lake City May 28, 2007. 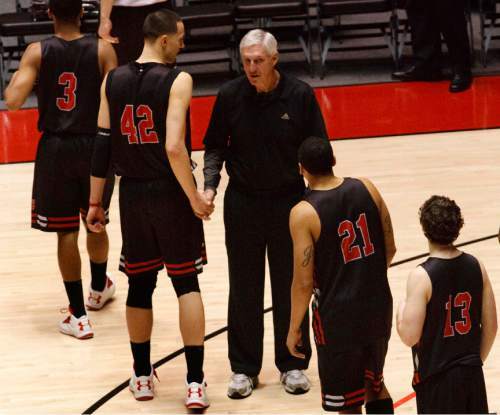 Leah Hogsten | The Salt Lake Tribune Former Utah Jazz basketball head coach Jerry Sloan, who spoke to the team after practice, is thanked and greeted by University of Utah basketball team members Wednesday, March 6, 2013. Leah Hogsten | The Salt Lake Tribune l-r Newly named Jazz Head Coach Tyrone Corbin, reacts to the announcement as Phil Johnson and Jerry Sloan lead the applause. Jerry Sloan resigned as coach of the Jazz on Thursday, February 10, 2011, in Salt Lake City, bringing to a stunning end a long career in Utah that included most of his 1,221 career coaching victories and induction into the basketball hall of fame.Longtime assistant coach Phil Johnson also resigned. Former assistant coach Tyrone Corbin is now the head coach. The announcement was given at a press conference at 3 p.m. at the team's practice facility. 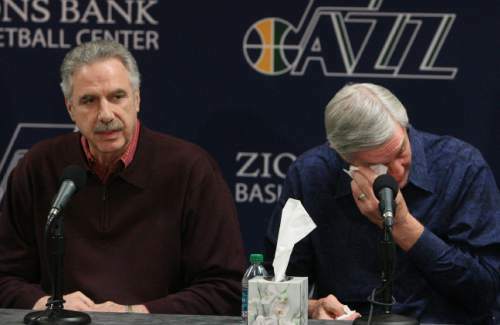 Leah Hogsten | The Salt Lake Tribune l-r Phil Johnson, Jerry Sloan show their emotions during their resignation speeches. Jerry Sloan resigned as coach of the Jazz on Thursday, February 10, 2011, in Salt Lake City, bringing to a stunning end a long career in Utah that included most of his 1,221 career coaching victories and induction into the basketball hall of fame.Longtime assistant coach Phil Johnson also resigned. Assistant coach Tyrone Corbin will be named interim head coach. The announcement was given at a press conference at 3 p.m. at the team's practice facility. Phil Mascione | Chicago Tribune Photo Nicknamed "The Original Bull," Jerry Sloan was in Chicago during the franchise's first 10 years. His grit and toughness made him one of the league's best defensive players and is one of only 18 players in history to be named to the NBA's All-Defensive First Team four times. He averaged 14 points, 7.5 rebounds and 2.5 assists during his 11 season. Sloan is now one of the league's most respected coaches, having led the Utah Jazz to two NBA title games. April 18, 1975. Scott Sommerdorf | The Salt Lake Tribune John Stockton, left, and Karl Malone, right, laugh during a press conference to honor former Jazz coach Jerry Sloan as Sloan relates a story about their time together with the Jazz on Friday, Jan. 31, 2014. 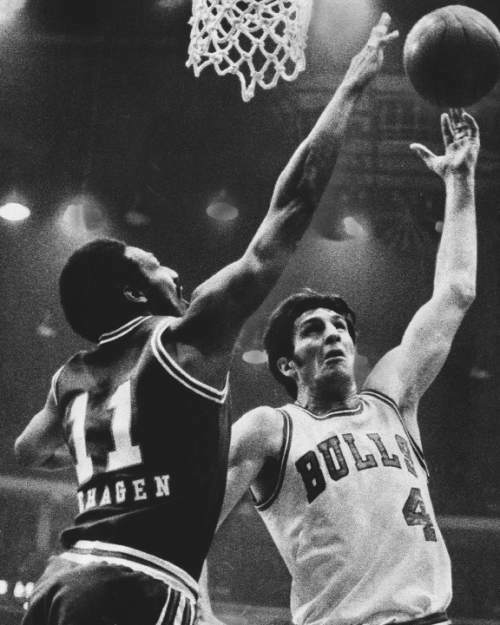 Ed Feeney | Chicago Tribune Photo The Bulls had their first winning seasons starting in 1970, when they posted four consecutive seasons with 50 or more wins. 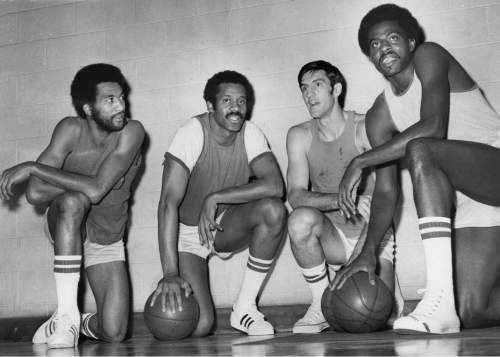 On those teams were Norman Van Lier, left, team captain Chet Walker, the original Bull, Jerry Sloan, and Bob Love, Nov. 1, 1973. 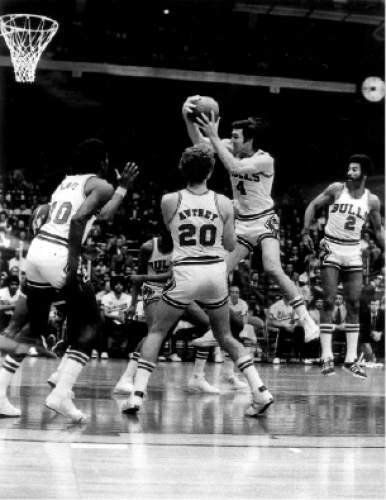 Phil Mascione | Chicago Tribune Photo Jerry Sloan pulling down a rebound amidst a head of Bulls. 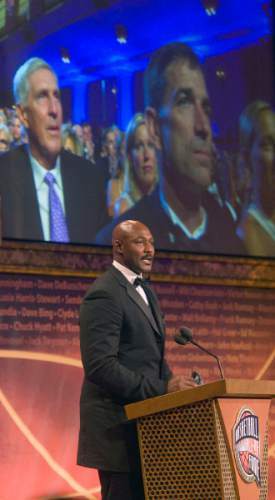 | Tribune file photo With images of Coach Jerry Sloan and John Stockton above him Karl Malone speaks as he is inducted into the Naismith Memorial Basketball of Fame in Springfield Massachussetts in 2010. Chris Detrick | The Salt Lake Tribune Utah Jazz head coach Jerry Sloan before the game at Energy Solutions Arena on Friday, Oct. 22, 2010. Riverton • In his immaculate, memorabilia-filled home office, Jerry Sloan sits in a chair beneath a framed handwritten letter from President Barack Obama. "I&apos;m not looking for publicity," he tells a reporter. "But I feel I have to talk straight to people so they know what&apos;s going on." So here&apos;s the news, as straightforwardly as Sloan would deliver it himself. The former Jazz coach and Hall of Famer  the coach with the third most wins in NBA history  is battling Parkinson&apos;s disease and a form of dementia called Lewy body dementia. There is no cure for Parkinson&apos;s disease, although, in some cases, medication can "markedly improve symptoms." But in Sloan&apos;s case, the symptoms continue to progress. Lewy body dementia is a neurological disorder that manifests itself as difficulty with memory, problem solving, planning and analytical thinking. While the numbers differ, Lewy Body Association says about 1.4 million Americans have the disease. &apos;It was life and death once&apos; • "You try to be optimistic," says Tammy Sloan, seated next to her husband. "But it is what it is. Jerry&apos;s had a wonderful life  the best life you can possibly imagine. But this is not going to reverse itself and go away." There are good days, however. "When a basketball game comes on TV," Tammy Sloan said, "he knows everything that&apos;s ever happened." "It was life and death once," her husband noted. 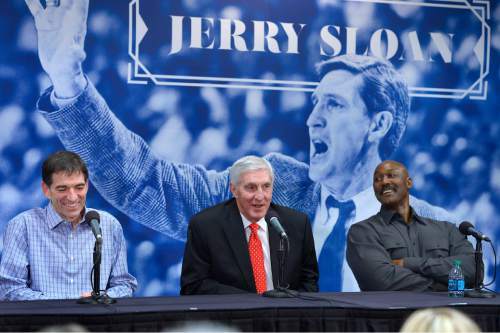 Last week, Judy Adams, a former Utah Jazz executive assistant, organized a surprise party for Sloan&apos;s 74th birthday. A handful of close friends attended, including Frank Layden, who hired Sloan as one of his assistant Jazz coaches in 1984. "Every day is a different day," Tammy Sloan said. "Some days he&apos;s fine, and some days he&apos;s not so fine. But at that birthday party, he was as normal as he&apos;s ever been. … He was in prime form, telling stories." Sloan&apos;s health issues surfaced about a year ago, when his wife first noticed some Parkinson&apos;s-like symptoms, including a tremor in his right hand. After talking to his son, who is a doctor, Sloan decided to undergo neurological tests. The diagnosis, made last fall, was infinitely more devastating than any last-second loss. With a tear glistening in his eye, Sloan said, "It was a little scary because I thought, &apos;Now what am I going to do? 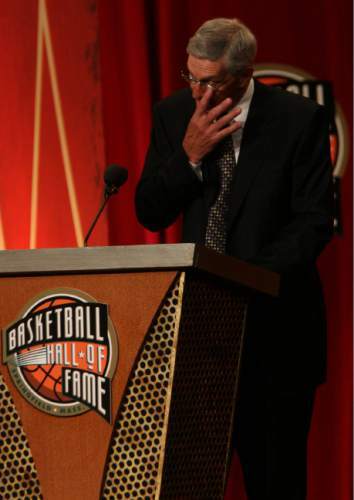 My career is over.&apos; "
Hall of Fame career • Sloan, 74, coached the Jazz from 1988 to 2011. He was elected to the Naismith Basketball Hall of Fame in 2009. Two NBA coaches have more wins than Sloan&apos;s 1,221  Don Nelson (1,335) and Lenny Wilkens (1,332). Known for his fiery competitiveness, Sloan replaced Layden as head coach on Dec. 9, 1988, after four seasons as a Chicago Bulls coach and four with the Jazz. Over the next 23 seasons, he guided the Jazz to a record of 1,127-682. Utah reached the Western Conference finals five times between 1992 and 1998. With a team built around Hall of Famers John Stockton and Karl Malone, Sloan coached the Jazz to the NBA Finals in 1997 and 1998, where they lost both times to the Bulls. An abrupt exit • Sloan walked away from coaching suddenly, quitting midway through the 2010-11 season after tiring of battles with Jazz point guard Deron Williams  who was later shipped to the Brooklyn Nets in a deal that brought power forward Derrick Favors to Utah. He has worked as a consultant for the Jazz in recent years, but he hasn&apos;t done much lately, other than a little scouting and endorsing the selection of rookie Trey Lyles in last year&apos;s NBA draft. 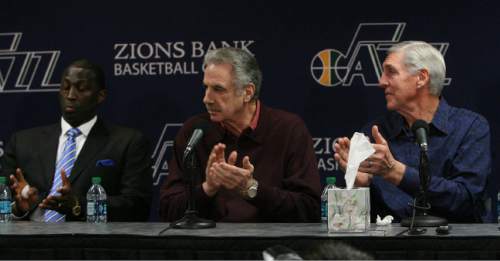 On Wednesday evening, the Jazz saluted their longtime coach. 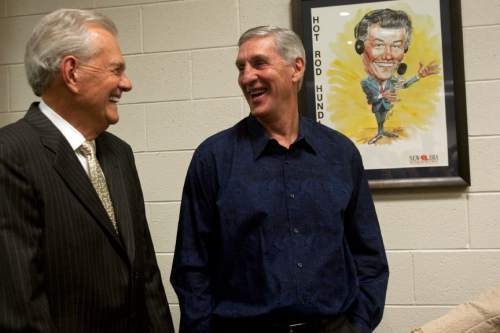 "Jerry Sloan is and always will be a beloved member of the Utah Jazz family, and we know he will approach this fight with the same grit and determination he displayed as a Hall of Fame coach and All-Star player in the NBA for 40-plus years," the team said in a statement. "On behalf of the Miller family, the Jazz organization and Jazz fans everywhere, we send Jerry and his wife ,Tammy, our love, support and best wishes." Friends and the future • Sloan is unsure of what lies ahead. "The shaking has gotten worse," he said. "Everything else has stayed about the same. That&apos;s why, each day, I&apos;m waiting for something drastic to happen. But nothing like that has happened so far." Sloan continues to see several doctors. He has a checkup scheduled for Thursday at the University of Utah. At the urging of former Jazz star John Stockton, he has also driven to Pocatello for some nontraditional treatments. Attempts to reach Stockton and Karl Malone were not immediately successful Wednesday evening. "John thinks he&apos;s going to find a cure," Tammy Sloan said. "And we&apos;re like, &apos;Yeah. Go, John.&apos; "
Sloan grimaces at the mention of Pocatello, where he gets injections into his head. "That&apos;s a fun trip," he quipped. "They go all the way around with a needle." Said Tammy Sloan: "I don&apos;t even watch." Once, during a discussion of possible ways to fight his illnesses, a doctor suggested Sloan learn a foreign language to help keep his mind active, and to start playing the piano to help his coordination. He declined: "I didn&apos;t like school. I didn&apos;t even like holding a pencil." At home these days, Sloan maintains a routine that includes a 4-mile walk every morning. He usually takes his dog. His wife keeps an updated calendar of events on the large wooden desk in his office to help him remember any approaching events in their lives. Like an upcoming trip to the DMV. Sloan also must pass a test every six months to keep his driver license. He did so last fall and hopes to do it again, even though Tammy does most of the driving. "That test a little intimidating at this point," Sloan said. "But I don&apos;t want to be complaining. You do what you can do. People have to live their own life without worrying about someone like myself."